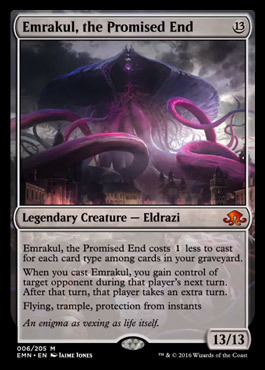 Sorin, Grim Nemesis can reveal Emrakul to deal a huge thirteen points to the opponent… But when it actually comes time to cast her, Emrakul might cost just seven or so mana (say your graveyard is full of Dead Weight; Transgress the Mind; Anguished Unmaking; Gideon, Ally of Zendikar; Kalitas, Traitor of Ghet; and Evolving Wilds)… That will only make for seven mana! Patrick and Michael spend a good part of the podcast thinking up cool, goofy, or actually powerful things you can do with Emrakul, the Promised End; for example “Dark Petition up Emrakul, discard her to Jace, Vryn’s Prodigy (or Nahiri the Harbinger), put her back on top of my library with Mortuary Mire, and then reveal her for thirteen with Sorin, Grim Nemesis. Of course just playing Sorin and Emrakul in the same deck gives you a way to win any game [that you did seven damage] out of nowhere. Unfortunately (and this will happen with new cards sometimes) Patrick conflates the abilities of Sanctum of Ugin and Conduit of Ruin. Sanctum of Ugin puts a card into your hand, not on top of your library. Sorry! We’ll get ’em next time. Many of the ideas are still worth chewing on, though. We also discuss new cards Coax from the Blind Eternities and Ulrich of the Krallenhorde. How does Ulrich compare with Standard staple Goblin Dark-Dwellers? You might be surprised at our take. How tall is Kevin Durant? How tall does he claim to be? Who are the best five players in 2016? What year would you pick an all-time five from (if not 2016)? You know, and a ton Ton TON of Magic: The Gathering at 1:47 this week! It’s time for the first Top Level Podcast Deck Doctor episode! Our Patrons probably already know this, but one of the higher level rewards on our Patreon page is “mini-deck doctor” … So in anticipation for that cool feature coming up — and in the tradition of “Mike’s Do-Nothing Naya Deck” (“That deck actually did everything, not nothing!” -Mike), Patrick unleashes his Innovations on a couple of Mike’s current Standard decks. There you have it! Our first Deck Doctor episode! To learn how to get your ideas featured in a future Deck Doctor, check out our Patreon page. 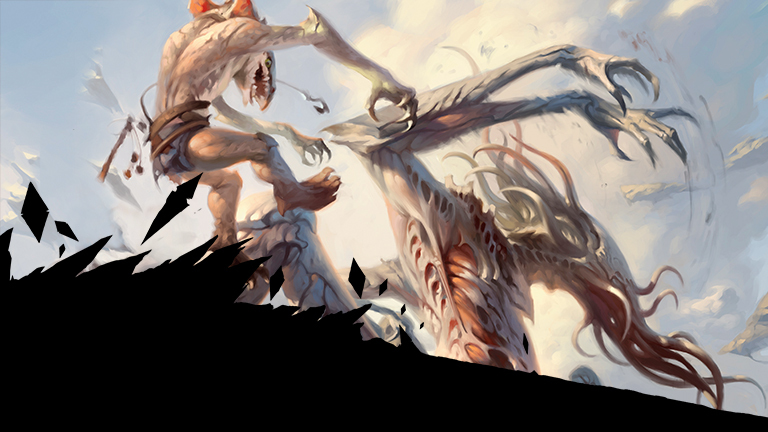 Double topics this week… We start on Standard, but then uncover why Patrick is probably playing Karakas in Legacy. To the surprise of no one, Tom Ross hit #SCGATL with “eighteen Plains” … or rather, fourteen Plains and four copies of Battlefield Forge. Those Battlefield Forges do act as (painful) Plains main deck, but don’t have much immediate reason to tap for red. After sideboarding, Tom brings in four copies of Needle Spires. This is nothing new… The post-sideboard version of R/W Humans wants to go up to twenty-two lands as it increases costs. Battlefield Forge and Needle Spires get along well, of course, with one powering up the other. But why go up to twenty-two lands to begin with? So many of these white Humans decks side in Gideon (which is much more expensive than anything in Tom’s main)… But Tom didn’t play Gideon at all! If you think about it, that makes a lot of sense. The B/W Control deck has plenty of cards like Ruinous Path and Anguished Unmaking to handle Gideon; Tom figured out to attack the format at a different angle. Instead of Gideon he brought in an actual red card, Reckless Bushwhacker. And waits as he fills his hand. After sufficient resource repair, Tom can send up a massive turn based on dropping all the power in his hand and finishing with Reckless Bushwhacker. Probably for lethal. Why would you ever want to play Invocation of St. Traft? How to exploit a metagame where there are two fewer removal cards per deck? 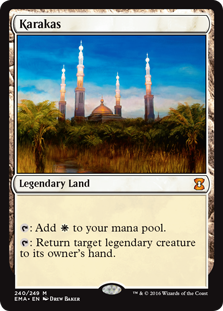 We then switch gears to do a little Legacy brewing for this week’s upcoming Grand Prix. Will Patrick play a deck with Jace, the Mind Sculptor or one with Cavern of Souls? One thing is sure: His deck will be able to return a legendary creature to its owners hand! Izzet Time to Go Rogue? G/W Tokens was once again the deck of the weekend, winning not one but two Grand Prix tournaments on opposite sides of the Atlantic on the same day! But… Izzet time to to rogue? We are so wealthy with awesome new builds and ideas that both Patrick and Michael loved a Shivan Reef deck best… and they weren’t even the same list. That’s right! Green-white… Red? And that pair of Chandras can be cast only via Oath of Nissa. Boom. 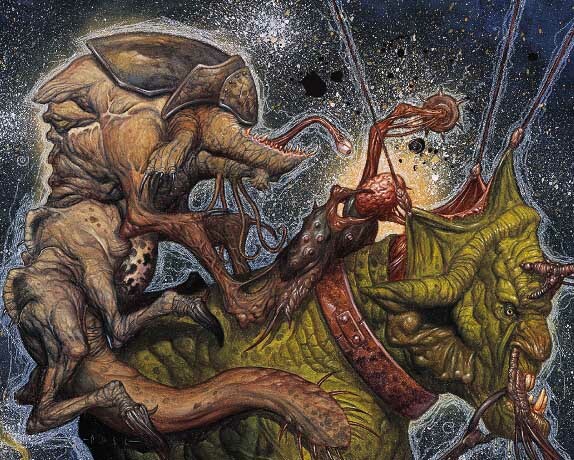 Patrick details many cool acceleration and Eldrazi Scions interactions in Hunt’s deck. This is a deck that is chock full of technology! Like… Why does a deck that can tap for red play Spacial Contortion instead of Fiery Impulse or Draconic Roar? How cool is a deck that taps “out” for Hedron Archive… And then Warping Wails your incoming Infinite Obliteration? Boom boom. Take a look at that for a second. Saito basically has twelve copies of Welkin Tern. Sure Rattlechains can hook up Rattlechains once in a Blue Moon and there are a couple of Shivan Reefs for Dimensional Infiltrator… But a lot of the time, that Stratus Dancer is going to hit the table face up. Between Fevered Visions and Exotic Firecraft Saito has good reach; and between Fevered Visions and Goldnight Castigator he has outstanding planeswalker defense. This deck is the hottest; and the coolest! What do you guys think? Which is the best Shivan Reef deck? And Izzet time to go rogue? Find out!